This realistic looking manikin has an adolescent-size head and upper torso which allows for practice of abdominal thrust, chest thrust, and back blow procedures for clearing foreign objects. 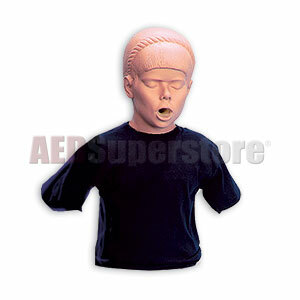 This manikin is made with specially selected durable vinyl to create tactile realism. When correct clearing procedures are performed, this manikin will expel the object causing the obstruction. The choking objects provided make excellent practice obstructions. Each manikin has a ribcage, xiphoid process, and jugular notch to provide anatomical reference points for the demonstration of hand placement for CPR. Size: 24" x 14" x 9"
I got this so my students can see how it feels to help someone who is choking.